Silicon is the base compound of micro-electronics. In recent years, research is carried out for developing molecular electronics, where individual functional molecules are used as switchers, diodes, transistors... It is therefore tempting to integrate such organic molecules within silicon-based technology. Problem comes from the fact that these molecules usually hold several chemical functions which make difficult their grafting. Controlling the deposition of simple molecules on the so-called « technological » crystalline face of silicon, the (100) face, is the key for developing such hybrid compounds. Researchers from the « Physics, Chemistry and dynamics of surfaces » team, in the INSP, in collaboration with a theoretical group in Rome, could determine the geometry of adsorbed ethylene (C2H4) adsorbed on the Si (100) surface. 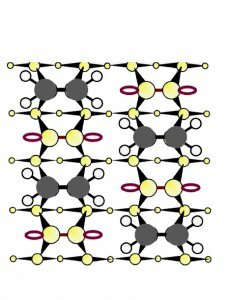 This molecule is a paradigm for studying the behavior of a double bond C=C on the silicon surface. Moreover, real-time monitoring of the ethylene deposition showed the presence of two distinct stages, which was not a priori expected on this surface. 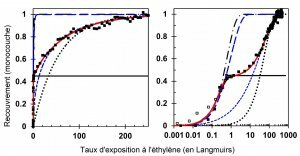 The researchers could reproduce very accurately the adsorption kinetics by use of a statistical model, which demand reconsidering the classical models for kinetics. 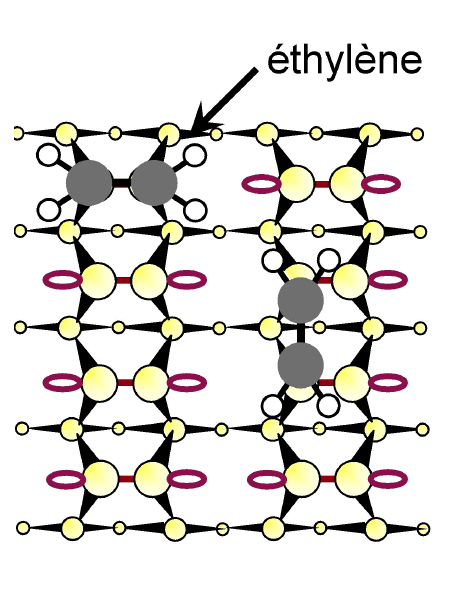 The (100) surface of silicon, when prepared under ultra-high vacuum, is reconstructed and forms silicon dimers which are perfectly aligned (Figure 1). Therefore, it can be used as a template for the formation of molecular films, in order to organized organic nanostructures at the surface. Side and above views of the Si(100) surface. 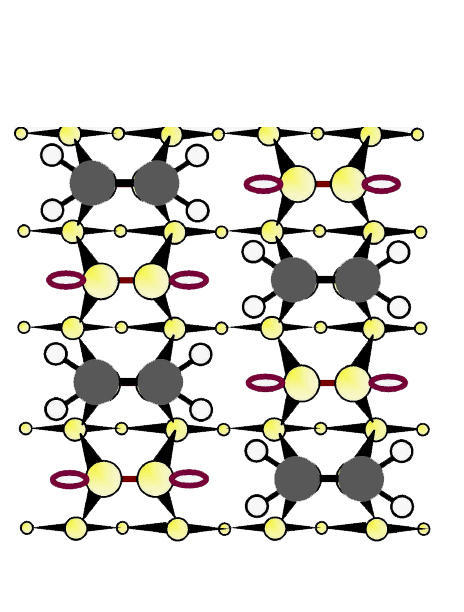 2D STM image. 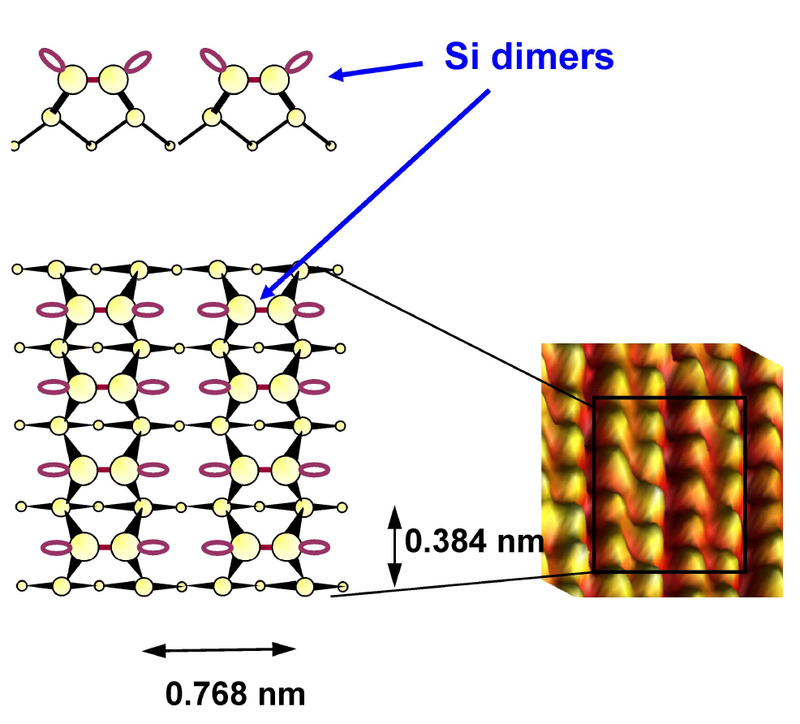 Silicon dimers hold two dangling bonds (i.e. half-filled electronic orbitals) and are therefore very reactive. Ethylene molecules can bind with the dimers following two different ways, the « bridge » configuration or the « on-top » one. ; the double bond C=C of ethylene is broken and its π orbital is engaged in two covalent bondings with the dangling bonds of two neighbor dimers (first case) or of only one dimer (second case), as outlined in Figure 2. By comparing the surface optical anisotropy measured at the INSP with ab initio calculations performed in Rome, the researchers could demonstrate that, whatever the coverage (half monolayer or full monolayer), the molecules are adsorbed with the « on-top » configuration, even if this configuration is not the most stable for the full monolayer. This is explained by the energy barrier that molecules cannot overcome at room temperature, in order to pop over from one configuration to the other one. Ethylene molecules in « on-top » (left) and « bridge » (right) configurations. In order to monitor the adsorption kinetics of ethylene on this surface, the researchers used another ultra-sensitive optical method, the surface differential reflectance spectroscopy, which in-situ measures the variations of reflectance of the sample, during the molecule deposition. This techniques is sensitive enough to demonstrate the presence of only a few molecules on the surface. As all the sites of adsorption are identical (one ethylene molecule on one silicon dimer), a « classical » kinetics described by the Langmuir model is expected, where the adsorption probability of a given molecule is proportional to the number of available sites. However, it has been shown that the kinetics is a two-step process ; the first step is easy and leads to almost half-monolayer, with every ethylene molecule bound to one dimer out of two along a dimer row (Figure 3). 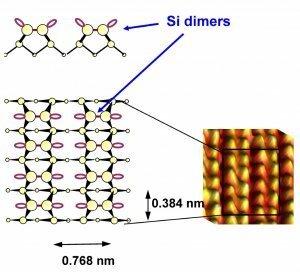 The second step is about three orders showier than the first one and yields a full monolayer, where the additional molecules have to « slip » between the already adsorbed molecules. This kinetics is described in Figure4, both in linear scale and logarithmic one, where the intermediate stage corresponding to about 0.5 monolayer is clearly evidenced. 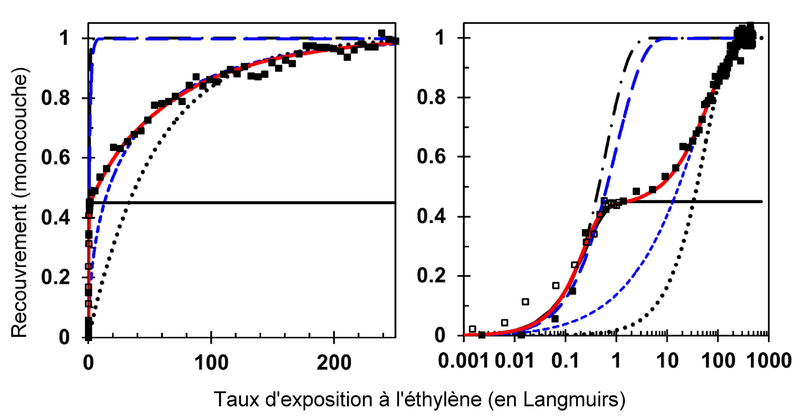 This adsorption kinetics is not reproduced by the usual models described in textbooks discussing gas adsorption, as the Langmuir model (black line) or the more sophisticated Kisliuk model (blue line). Consequently, the researcher of the INSP team developed a « random choice » model, called the Monte-Carlo model. The used mechanism is the following : when a molecule arrives on an isolated dimer, it sticks on it with a probability equal to1 ; if it impinges on already occupied dimer, it can either diffuse on the surface, either desorb back in the gas phase ; if it impinges on an empty dimer neighboring an occupied one, it sticks with a very reduced probability because of repulsive effects with the neighbor molecules, or it diffuses. This very much reduced sticking probability (by a factor of 500) is the main parameter to be determined and it yields the red curve in Figure 4, in perfect agreement with the experimental results. Amount of ethylene in monolayer, as a function of the exposure rate (in mbar/sec). Filled or empty black square : experimental points. Black curve : Langmuir model with different adapted parameters. Blue curves : Kisliuk model with different parameters. Red curve : Monte Carlo model. 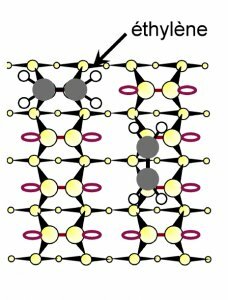 This investigation provided the detailed reaction process of a molecule with the silicon surface, and in particular the understanding of the conditions needed for obtaining a complete and homogeneous organic layer. Since we want to use molecules to assure electronic, optical functions or reactivity, we need to prepare molecular layers as uniform as possible, and the complexity of the chemical reactivity is often an obstacle to obtain such uniformity. The phenomenon highlighted here opens the way to a better understanding, on the scale of the molecule, of the processes of adsorption and of the interaction involved, for example in catalysis, in sensors, or in gas separators.